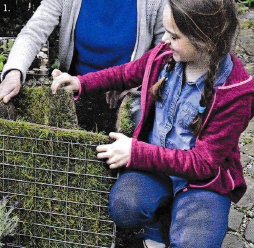 Nature In A Basket - Devoran Garden Gabions Ltd. 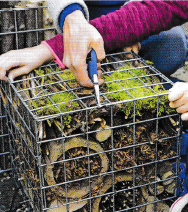 Step 1: Line the sides of the gabion container with a little help to ensure they are neatly in place. 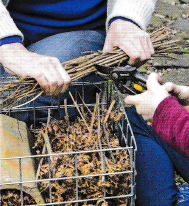 Short lengths of tree prunings or sturdy sticks are chosen, cut by an adult to fit the depth of the gabion. They are placed tightly side by side to create a natural wood layer.An alternative lining for the container can be made using squares of grass turf, to help retain moisture when the plants are added. Regular watering will help to keep the turn green. It can be trimmed with shears, but if left to grow longer, will cover and hide the mesh. Step 2: An old compost bag is placed inside the lined container with a few small holes in the bottom for drainage. it should be big enough to cover the sides so the compost does not wash away. Fill the bag a few inches shy of the top of the compost. Step 3: Plant scented French Lavender, Lavandula stoechas, and other herbs. 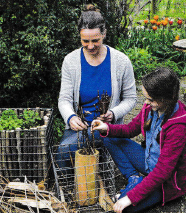 Lower the plants carefully into the gabion. Remember to wash hands after using compost. Step 1: Fill the hollow centre of a section of clay pipe with twigs. 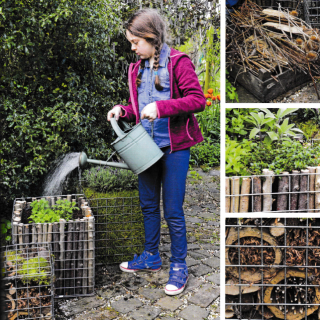 This will make an ideal hideaway for a variety of small insects. Step 2: Under adult supervision, snip a bundle of dry twigs to size. They are then packed into the gabion container around the pipe, holding it in place. Step 3: Layers of pipe, wood, twigs and sticks are topped with turf. 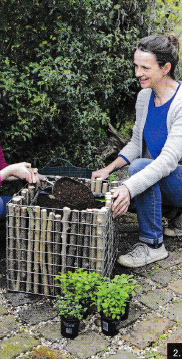 The lid of the gabion basket is then safely secured with pliers by an adult. Our fantastic range of small garden gabions in 300mm, 375mm and 450mm would be ideal for this project. 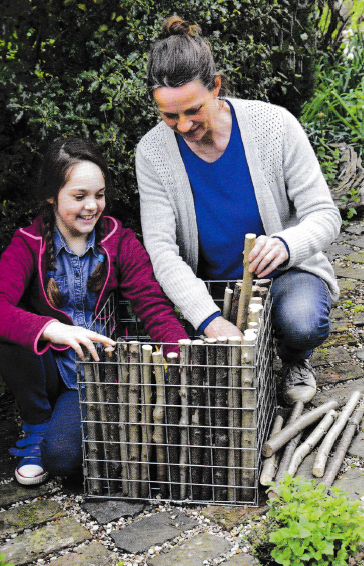 Shop our range of small gabions here.